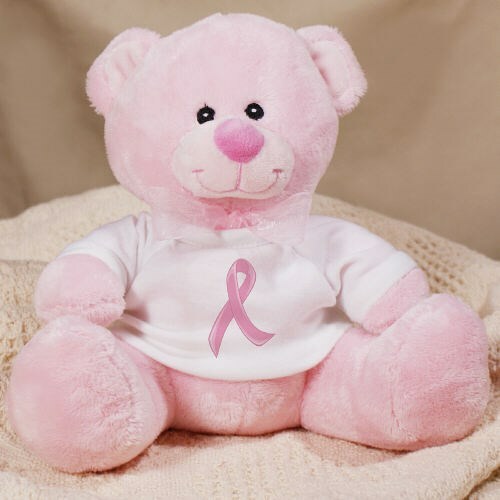 Get a Breast Cancer Awareness Teddy Bear & help the Fight against Breast Cancer. Each huggable pink bear makes a clear statement of how important breast cancer awareness is and is the perfect keepsake for supporters, survivors, physicians and anyone who wants to show they are joining us in the fight for a cure. Your Plush Breast Cancer Pink Teddy Bear measures 8” tall and is handmade with and adorable sheer pink bow. Each soft breast cancer awareness teddy bear is surface washable and safe for all ages. Perfect for Breast Cancer Awareness Events and Giveaways. Our bears also make for unique breast cancer awareness gifts for anyone fighting. Today’s Price: $20.99 Temporarily out of stock. Please check back. Additional Info We carry a unique and extensive line of Breast Cancer Awareness Pink Ribbon Apparel and Walk Gear. If you have an upcoming Breast Cancer Awareness Event that you are participating in, then standout among the rest with our unique and eye catching Breast Cancer Awareness Apparel. With our unique line of Breast Cancer Awareness Apparel, you can outfit your entire awareness walk team to help spread awareness. Take a peek at our Personalized Breast Cancer Walk T-Shirt and our Hope and Love Breast Cancer Awareness Water Bottle to get started today.